This week at I Heart Cooking Clubs we're all about fresh, seasonal vegetables. Our theme of "Veg Out!" means we get to choose any one of Nigel Slater's veggie laden recipes for the task. Sounds easy enough, right, until you have a look at just how many such recipes Nigel has in his arsenal and try to narrow down the choice. Today is the first day of winter here in New Zealand, so I was definitely on the lookout for something warming, and quite possibly "soupy". When I stumbled across "A new pumpkin laksa for a cold night" in Tender, Vol. I, I knew I'd struck gold. I'm not personally a huge fan of your run-of-the-mill pumpkin soup - it's ok, I guess, but it just doesn't excite me. I do, however, love a good laksa, and the idea of combining the aromatic, coconut-rich broth and noodles with the sweet nuttiness of pumpkin really appealed. Nigel says that, since first making this dish, he has constantly tweaked the recipe, taking things out and putting things in, according to mood and availability of ingredients. He does caution, however, that this needs "to be done with care; you don't want too many flavours going on. Vietnamese soups such as this" (actually to the best of my knowledge a laksa is a Malaysian dish, not Vietnamese, but that's what Nigel calls it and I'm just quoting here) "are traditionally ingredient rich but should never taste confused. By the same token to simplify it too much would be to lose the soup's generosity and complexity and therefore its point." He goes on to say "The laksa appears complicated at first but in practice it is far from it. Once you understand the basics, the recipe falls into place and becomes something you can fiddle with to suit your own taste. The basic spice paste needs heat (ginger, garlic, tiny bird's eye chillies); the liquid needs body and sweetness (coconut milk, rich stock); the finish needs sourness and freshness (lime juice, mint, coriander). The necessary saltiness comes from nam pla" (fish sauce) "and tamari rather than salt iteself. These notes in place, you can feel free to include noodles, tomatoes, greens, sweet vegetables or meat as you wish. What matters is balance." I did make quite a few changes to this recipe. Whilst I am normally one to be stripping recipes back and simplifying them as much as I can, in this case I did up the ante a bit on a number of fronts, which did make the dish a little more complicated (not much), but it was truly worth it. Firstly, the pumpkin. Nigel suggests steaming the pumpkin, but I was imagining the pumpkin replacing the fried cubes of tofu you might ordinarily find in a laksa, and decided that tossing it with a little sesame oil and roasting it was the way to go. I also added a shallot, some whole toasted coriander and cumin seeds, a few macadamia nuts, a couple of kaffir lime leaves, and some ground turmeric, coriander and cumin to the curry paste. I wanted an extra punch of heat, so added in some red curry paste. I served this with rice vermicelli, and some blanched bok choy and bean sprouts. Chunks of cucumber, shredded Chinese cabbage, halved hard-boiled eggs, shredded leftover chicken, cubes of fried tofu, or prawns would all be great options for a few alternative add-ins. This laksa was perfect for a cold winter evening. The sweet, soft, nutty pumpkin, silky rice noodles, crispy bok choy and bean sprouts, all bathed in a gorgeously fragrant, coconut-rich broth, was a symphony of flavours and textures, and even though I did a little bit extra for this dish it was hardly arduous work. I will definitely make this again. Preheat oven to 220 degrees C (390 degrees F). Peel and de-seed pumpkin, and cut into bite-sized chunks. Put pumpkin pieces into a small bowl. Add a generous drizzle of olive oil, and cautious drizzle of sesame oil, along with a generous pinch of flaky sea salt and plenty of freshly ground black pepper. Toss everything together until pumpkin is well coated with oil and seasonings. Tip pumpkin out onto an oven tray lined with baking paper, and bake in the preheated oven until golden and just tender - this will probably take around 25 minutes. Remove from oven and keep warm. To make the laksa paste, begin by toasting the coriander and cumin seeds in a dry pan until fragrant and slightly coloured. 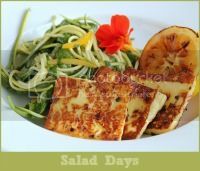 Remove from pan and add to blender or food processor, along with chillies, shallot, garlic, ginger, lemongrass, fresh coriander, lime leaves, macadamia nuts, and sesame oil. Blitz until you have a rough paste. Heat a generous slosh of sunflower oil (about a tablespoon) in a large, deep pan set over medium heat. Add red curry paste to the pan, and cook, stirring constantly, for a few minutes until the paste is fragrant and "burnished" (but not burnt!!). Remove paste from pan and set aside. Return pan to the heat with another generous slosh of sunflower oil, and a slightly more restrained slosh of sesame oil. Add ground coriander, turmeric and cumin to the pan and fry for about 5 minutes, stirring constantly. Add the laksa paste to the pan, and cook for several more minutes, stirring constantly, until the paste is very fragrant and almost a little "jammy". Stir in the red curry paste, chicken stock, coconut milk, fish sauce and lime juice. Bring to the boil, then reduce to a simmer for several minutes. Meanwhile, prepare noodles according to package instructions, and blanch the bok choy and bean sprouts. To serve, add noodles to deep bowls. Top with bok choy, bean sprouts and roasted pumpkin. Pour over the hot broth, and finish with some fresh coriander and mint leaves. I'll also be sharing this post this week at See Ya In the Gumbo hosted by the delightful Michelle at Ms. enPlace, at Souper (Soup, Salad & Sammies) Sundays hosted by my lovely friend Deb at Kahakai Kitchen, at Weekend Cooking hosted by Beth Fish Reads, at Foodie Fridays hosted by Designs by Gollum, and at Cook Your Books hosted by the lovely Joyce at Kitchen Flavours. 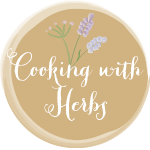 And for just a little more sharing "love", I'm sharing this post at Cooking with Herbs, created by the lovely Karen at Lavender & Lovage, and hosted this month by Lancashire Food. I would enjoy this even in a hot summer day! Looks so comforting and tasty. Thanks, Angie. Yes, I agree, even on a hot summer day this would still be pretty wonderful. Oh man, this sounds wonderful! Such a beautiful bowl of laksa, Sue. Roasting veggies adds such great flavor and I definitely think roasting the pumpkin was the perfect way to start building flavor in this dish. I love all your additions and can see how each of them added their own hint of flavor in the final product. Gorgeous! Thanks, Kim. Yes, roasting the pumpkin definitely added another layer of flavour to the dish. 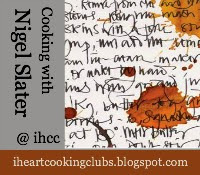 I know this Nigel Slater recipe well Susan... only because I read Tender 1 and 2 like other people might read the bible! But I've never made it... and now I will. Thanks for the divine intervention of a well-timed and inspiring blog post. I think roasting the pumpkin was definitely the way to go Sue. 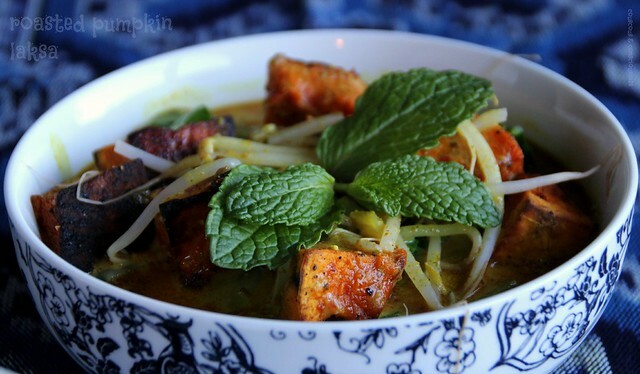 This is a gorgeous bowl of soup, I am such a laksa fan--you have me craving it now. I love that wel three IHCC co-hosts all chose to make soup this week. ;-) Too fun! Thanks for sharing with Souper Sundays too. 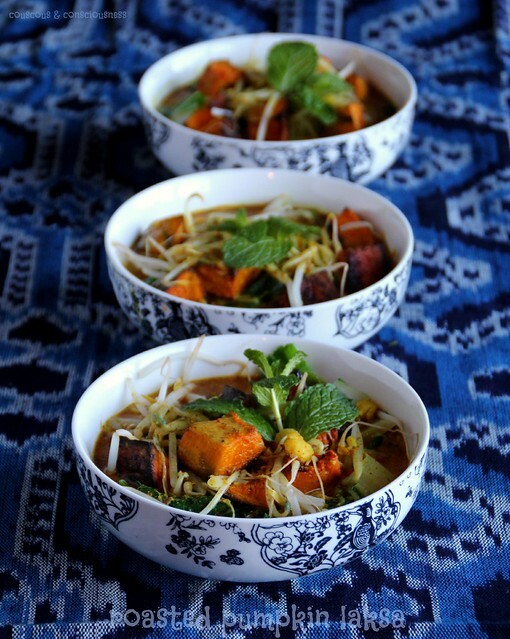 Lemongrass can be hard to get around here, but when I spot it, I'll think of this recipe. It looks wonderful. 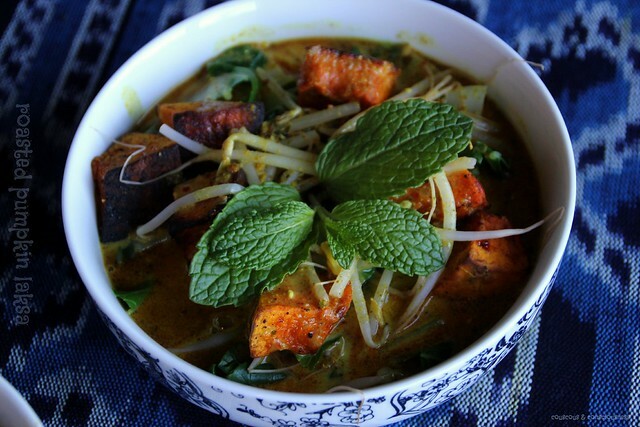 It can be a little bit hit and miss here too with lemongrass. If it's not available I would probably put a couple of strips of lime rind into the simmering broth. A delicious bowl of laksa, Sue! And I like it that you have added red curry paste for added oomph! I supposed Vietnam do have their own version of laksa, as our Malaysian laksa do not use any fish sauce. Laksa is one of my top favourite noodle dish. And like you, I like it spicy! Thanks, Joyce. I think the red curry paste definitely gave it a bit more punch. That's very interesting to hear that you don't normally use any fish sauce in a Malaysian laksa. This is a gorgeous bowl of comfort, Sue! I love all the flavors and textures. You made some wonderful adaptations! Thanks, Hannah. I know life is very busy for you right now, so I do appreciate you stopping by and taking time to leave a comment. The broth sounds amazing, never had laksa before, but after reading about this recipe I will have to try. Love Nigel Slater's cookbooks. Thanks, Cheri. Laksa is a great soup/noodle dish - I would love to hear what you think of it if you make it. I've never had laska but the flavours sound amazing! This sounds yummy--especially with roasted pumpkin! Thanks, Joy. I've had laksa often before with chicken or prawns, but I really liked the roasted pumpkin as an alternative. I like roasted veggies very much. Mmm...that coconut milk gives such a great flavor, you really did ante it up on this one. Nice choice for Veg Out! Thanks, Tina. I love roasted veggies too, and in this case the pumpkin and coconut are so perfect together. This would be a great addition to our meals. We are big into veggies these days. Thanks for stopping by, Chaya. This is a great dish for one of those "meatless" nights. I'm with you on pumpkin soup...has never really done it for me. This on the other hand sounds amazing & definitely one to make when back in the the depths of winter in NZ. I've never heard of laksa much less tasted it, but the idea of coconut milk and pumpkin sounds very appealing. Especially roasted pumpkin. Thank you for sharing with See Ya in the Gumbo this week, Sue!